Draft: 2011, Chicago Cubs, 17th rd. Attended the University of Connecticut, where he played for three seasons (2009-11). Hit .230 with four RBI in 26 games between the Mariners and Orioles in what was his first appearance at the big league level...Made his Major League debut on May 23 at Oakland, starting in right field...singled to right in the 5th inning for his first career hit...Had been selected from triple-A Tacoma prior to the game on May 23...was optioned back to triple-A on May 28 and recalled again July 7 before being optioned back to the Rainers on July 9...Was designated for assignment on August 17 and claimed off waivers by Baltimore on August 18...In 89 games with triple-A Tacoma, hit .287 with 54 runs, 18 doubles, five triples, three home runs, 36 RBI, 55 walks and 19 stolen bases...Was designated for assignment by Baltimore on October 31 and claimed by Seattle. Spent his third straight season with AAA Iowa…in 119 games, hit .244 (105x430) with 81 runs, 24 doubles, 8 triples, 14 home runs, 49 RBI and 26 stolen bases…T1st in Pacific Coast League in steals, T10th in triples and 11th in runs. March 23, 2019 San Francisco Giants traded OF John Andreoli and cash to Minnesota Twins for CF Michael Reed. March 23, 2019 OF John Andreoli assigned to Rochester Red Wings. 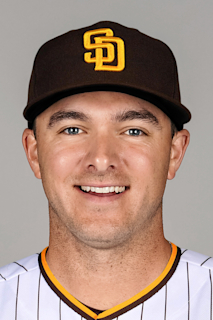 February 14, 2019 San Francisco Giants invited non-roster OF John Andreoli to spring training. February 8, 2019 San Francisco Giants sent RF John Andreoli outright to Sacramento River Cats. February 5, 2019 San Francisco Giants designated RF John Andreoli for assignment. February 1, 2019 San Francisco Giants claimed RF John Andreoli off waivers from Texas Rangers. January 29, 2019 Texas Rangers designated RF John Andreoli for assignment. January 15, 2019 Texas Rangers claimed RF John Andreoli off waivers from Seattle Mariners. January 10, 2019 Seattle Mariners designated RF John Andreoli for assignment. October 31, 2018 Seattle Mariners claimed RF John Andreoli off waivers from Baltimore Orioles. August 20, 2018 Baltimore Orioles recalled RF John Andreoli from Norfolk Tides. August 18, 2018 Baltimore Orioles claimed RF John Andreoli off waivers from Seattle Mariners. August 18, 2018 Baltimore Orioles optioned RF John Andreoli to Norfolk Tides. August 17, 2018 Seattle Mariners designated RF John Andreoli for assignment. July 21, 2018 Seattle Mariners optioned RF John Andreoli to Tacoma Rainiers. July 20, 2018 Seattle Mariners recalled John Andreoli from Tacoma Rainiers. July 10, 2018 Seattle Mariners optioned RF John Andreoli to Tacoma Rainiers. July 7, 2018 Seattle Mariners recalled John Andreoli from Tacoma Rainiers. July 6, 2018 Tacoma Rainiers placed RF John Andreoli on the reserve list. May 28, 2018 Seattle Mariners optioned RF John Andreoli to Tacoma Rainiers. May 23, 2018 Seattle Mariners selected the contract of John Andreoli from Tacoma Rainiers. May 2, 2018 Tacoma Rainiers activated RF John Andreoli from the 7-day disabled list. April 22, 2018 Tacoma Rainiers placed OF John Andreoli on the 7-day disabled list. April 2, 2018 OF John Andreoli assigned to Tacoma Rainiers. January 16, 2018 Seattle Mariners signed free agent OF John Andreoli to a minor league contract and invited him to spring training. November 6, 2017 CF John Andreoli elected free agency. May 6, 2017 Iowa Cubs activated CF John Andreoli from the 7-day disabled list. April 21, 2017 Iowa Cubs placed CF John Andreoli on the 7-day disabled list. Right hamstring strain. January 27, 2017 Chicago Cubs invited non-roster OF John Andreoli to spring training. January 29, 2016 Chicago Cubs invited non-roster LF John Andreoli to spring training. July 27, 2015 Iowa Cubs activated CF John Andreoli from the 7-day disabled list. July 8, 2015 Iowa Cubs placed LF John Andreoli on the 7-day disabled list. June 5, 2015 Iowa Cubs activated LF John Andreoli from the 7-day disabled list. April 9, 2015 LF John Andreoli assigned to Iowa Cubs. March 9, 2015 OF John Andreoli assigned to Chicago Cubs. October 30, 2014 OF John Andreoli assigned to Senadores de San Juan. September 20, 2014 Tennessee Smokies activated LF John Andreoli from the 7-day disabled list. June 15, 2014 Tennessee Smokies placed LF John Andreoli on the 7-day disabled list retroactive to June 11, 2014. March 15, 2014 OF John Andreoli assigned to Chicago Cubs. June 28, 2013 OF John Andreoli assigned to Tennessee Smokies from Daytona Cubs. March 3, 2013 LF John Andreoli assigned to Chicago Cubs. April 3, 2012 John Andreoli assigned to Daytona Cubs from Peoria Chiefs. March 27, 2012 OF John Andreoli assigned to Chicago Cubs. September 9, 2011 John Andreoli roster status changed by Peoria Chiefs. August 19, 2011 OF John Andreoli assigned to Peoria Chiefs from AZL Cubs. August 16, 2011 AZL Cubs signed John Andreoli. August 15, 2011 Chicago Cubs signed OF John Andreoli.